RANGERS brought in five players on loan from Newcastle United yesterday - here we take a quick look at the quintet who joined the Ibrox club on deals until the end of the season. Three out of the five were unveiled at Murray Park this afternoon, with Vuckic, Bigirimana and Streete paraded at the Rangers training ground. Former Newcastle and Gers stopper Olivier Bernard has already backed the five to make an impact at Ibrox, adding: “Rangers are desperate for points to ensure they get promotion. These players are good enough to see them back to the Premiership. “Three of them have already played at Premier League level in England, so know what will be expected of them. 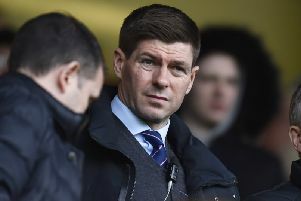 “Rangers will finish in the top two now and will be good enough to go through the play-offs, that’s a guarantee. Haris Vučkić is an attacking midfielder who signed for Newcastle United from Slovenian outfit Domžale. He made just five appearances for Domžale before joining the Magpies in January 2009, although he had to wait until the 2009/10 season before making his first appearances for the club. His European debut came against Greek outfit Atromitos in August 2011, as a second half substitute for Ryan Taylor. Vučkić scored the winning goal, earning Newcastle passage into the Europa League group stages. Vučkić played 12 times for Newcastle before joining Cardiff on loan in February 2012. However, he was recalled to St James Park barely a month later after an injury crisis at Newcastle and never returned to Wales. He had a lengthier loan spell at Rotherham, making 22 appearances and scoring four goals in the process. On the international stage, Vučkić has appeared for Slovenia at Under-17, Under-19, Under-21 as well as full squad. His only senior cap came against Scotland in February 2012, when he came on as a substitute for Valter Birsa in a 1-1 draw in Koper. A tall centre half, Remie Streete - the son of former Wolves and Cambridge defender Floyd Streete - arrives at Rangers having made just three senior appearances, all for Port Vale. Beginning his career with Boldon Colts, he signed for Newcastle’s academy in 2008, rejecting interest from Sunderland in the process. Streete won the inaugural Jack Hixon award in 2010, set up to recognise rising talent and signed professional terms with Newcastle the following year. Highly regarded by Newcastle United legend Alan Shearer, Streete suffered an ankle ligament injury in March 2012, sidelining him for 10 months. In and around the Newcastle first-team squad during Alan Pardew’s tenure, Streete was included in the teams to play Crystal Palace and Stoke City in September, delaying his move to the Valiants. He made his debut as a half-time substitute in Vale’s match against Leyton Orient, helping the side record their first clean sheet of the season in a 3-0 win. However, he was recalled from his loan spell due to injuries to three of Newcastle’s regular centre back and returned to the Magpies in November 2014. Northern Irishman Shane Ferguson arrives at Ibrox with the most first-team experience, thanks to two loan spells with Birmingham City. He joined Newcastle’s youth set-up in July 2007, after six years with Derry City, making his first-team debut in a League Cup match in 2010 against Accrington Stanley. A flurry of first-team performances led to Ferguson putting pen to paper on a five-year contract in May 2011. Like Streete, he suffered ankle ligament damage in the summer before the 2011/12 season, and didn’t appear for the first team again until December. In February 2013, Ferguson joined Birmingham on a six-month loan deal, making 11 appearances and scoring his first ever senior goal. He returned to St Andrews in July 2013, signing a season-long loan deal, making 23 appearances. Ferguson has also been capped at Under-17, Under-19 and Under-21 level for Northern Ireland, as well as appearing for the ‘B’ team. To date he has made 18 international appearances, scoring one goal in a friendly against Finland in August 2012, before earning praise from Michael O’Neill for his part in Northern Ireland’s 1-0 win over Russia at Windsor Park in August last year. Born in Burundi, Gael Bigirimana arrived in England as a refugee in 2004 with his family, and was taken on trial by Coventry a year later. He worked his way up through the Sky Blues’ youth system, signing professional terms in summer 2011, making his debut against Leicester City in August, in a 1-0 defeat. In March 2012, he won the Championship Apprentice of the Year Award, and signed a five-year deal with Newcastle four months later for a fee believed to be between £500,000 and £1 million. His Magpies debut came in August 2012, in a 1-1 draw with Atromitos in the Europa League Fourth Qualifying Round match, while he made his Premier League bow in a 1-1 draw with Aston Villa in September of that year. His first goal came in a 3-0 victory over Wigan Athletic in December 2012. He expressed interest in representing Rwanda - his mother’s country of birth - in April 2012, and was considered for the Rwandan squad to play in the 2013 African Youth Championship qualifiers. Bigirimana knocked back an international call-up from Burundi in October 2012 due to the country’s political instability, and the following March was capped for England Under-20s in the 2013 FIFA Under-20 World Cup, making his debut in a 3-0 win against Uruguay in a warm-up match. The youngest of the loanees, Kevin Mbabu joined Newcastle from Swiss side Servette, after making just one appearance in a match against Lausanne-Sport in September 2012. Able to play at centre back or at right back, Mbabu impressed Newcastle scouts in an Under-19 match between Switzerland and Scotland as a 17-year-old, and a successful trial with the Magpies in January 2013 led to the Swiss stopper agreeing a three-and-a-half year deal with Newcastle. He has yet to make a first-team appearance but told the BBC after signing that he was prepared to bide his time and work his way into the first-team. Described as ‘strong, confident, skilful and a very good prospect’ by former Newcastle reserve team coach Willie Donachie, Mbabu has also turned out for his country at Under-16, Under-17, Under-18 and Under-19 level.